This is the blog entry I intended to write before all of the excitement of Kathy’s emergency surgery. 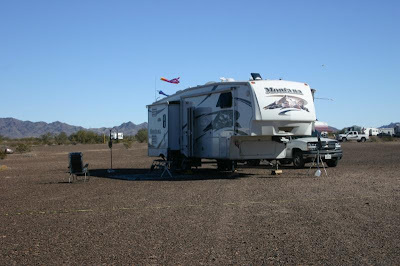 We were having a great time at the MOC circle in Quartzsite and had decided we would be staying for at least a third week and probably until the circle broke up, whenever that was. As you know from our previous posts our plans were changed. 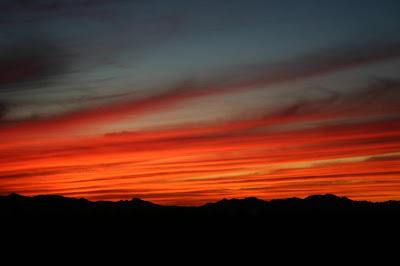 One of the great things this year in Quarzsite was the weather! Last year we had a few days of rain, some very cold nights and a lot of STRONG wind. This year everyday was 70 – 75, the winds where for the most part light, and the overnight lows were upper 30s to upper 40s. Last year we arrived after everything was in full swing and were overwhelmed by all of the new names and faces. By arriving a week early this year, we were able to learn names and faces a little at a time as people arrived. So, we really could put names and faces together. 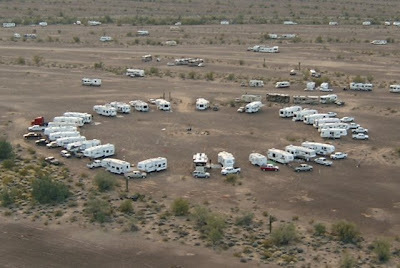 At its heart, the third week in January in Quartzsite is about the “RV Show”. 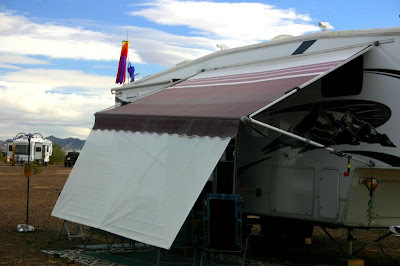 If you can’t find it here it probably doesn’t exist for an RV and there are many items that you never knew existed that you now can’t survive in an RV without. Like last year we came with a shopping list of items to get at the RV Show. Okay, all Kathy had on her list was beads, beads and more beads. 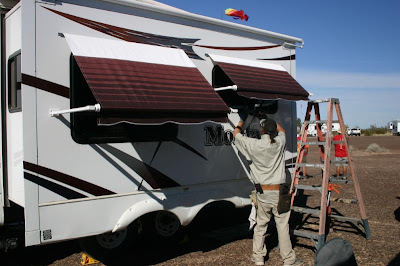 Number one on our list was window awnings. We have been to several places where we had direct afternoon sun on the living room windows. Although the windows are deeply tinted there is still a lot of heat that comes through them. On days like that we keep the window covers closed. 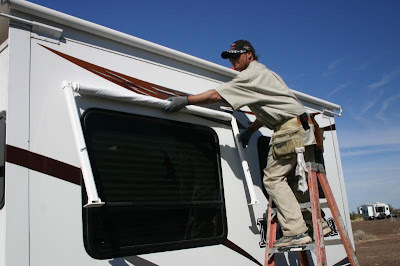 By adding window awnings we shade the windows and can even keep the windows open on rainy days. A great thing about buying things in Quartzsite is for the most part the installer comes to you out in the middle of the desert. Other things on our shopping list included: new patio mat, new water filters, new water regulator and a screen for our awning to provide shade when the sun is low on the horizon. What wasn’t on our list was an inverter. An inverter allows you to run 110 volt appliances like the TV, DVR, computers, router and most importantly the drip coffee maker, off of our 12 volt trailer batteries. 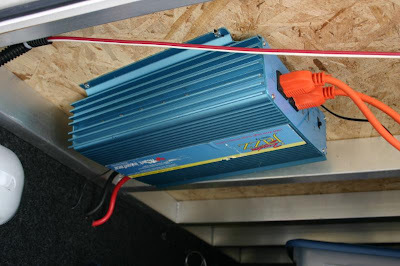 Our MOC friend Dave Anderson was upgrading his 1000 watt inverter to a 3000 watt inverter. So, I bought his old one. I have never been a handyman type of person and never went near anything electrical. However with a little guidance from MOC friend Carl (Butch) Youngren I was able to install the inverter! There I was drilling holes into the walls of our trailer and pulling wires from the batteries to the inverter and then from the inverter to the inside of the trailer. When it was all done it worked, without any sparks or fire. The beauty of an inverter is that you can make coffee, surf the internet, or watch TV without running the generator. This is something that our neighbors really appreciate if we wake up before they do. Also some National and state parks are very restrictive about when you can run a generator. People that use inverters are always worrying about how many AMPs they are using and how to save AMPs. One way to save AMPs is to replace the standard RV light bulbs with LED lights that draw only 6% of the AMPs that standard lights draw. Naturally we had to get some LED lights to use when we were in “inverter mode”. With the installation of the inverter we hope to do more boondocking without missing any of the usual convinces. PS Kathy must be better, she is beading again.